It was great to read about the wide and varied carriers and the ways people have moved on and seen the world. As you can see I’m still here running Geotechnical Developments (UK) Ltd in the Midlands. I’ll see if I can pull together some words and pictures over the next month or so. I’m about to get married (again!) and move house so lots of kit in boxes at the moment. MD of GD(UK) Ltd- Employ 28 staff and carry out a wide range of Geotechnical and Geo- environmental consultancy and investigation type work throughout UK and more recently in Europe. About to get married (June 2006) to Alison. I trust you are well and the department is flourishing? Recently had a look on the web site and see that the department are running some very interesting and worth while degree and post graduate courses. The industry needs these graduates desperately. I’m trying to encourage my son James- but whilst he s doing Geography at A level he has picked Business Studies and Technology instead of sciences or math’s so not sure if that’s of any use? The business is doing well with significant increase in work over the past few years. We’ve just opened a Northern office between Liverpool and Manchester to service that part of the world and will have about five staff up there by the end of the summer. That will bring the company strength to just over thirty staff with a range of geotechnical and geo/ chemical /environmental expertise. About to launch new web site so will drop you a line when that happens. As I mentioned in my last letter in 2006 I married Alison in June 2006 and have since then been trying to build a house!! Well it should be complete by August this year- fingers crossed. Its being built in a local stone (Hornton) so lots of opportunities to try and ID the fossils. We are utalising ground and air source heat and tapping into the ground water in the garden so going ‘green’- ish. It’s a pity we can’t get welsh slate for the roof though- and having to import from other countries which is a little annoying. Anyway Take Care and All the Best. Just a brief update- Still involved in geotechnical engineering- now playing role as consultant geotechnical engineer for another company. The recession hit my old business of 20 plus years- which wasn't much fun- don't recommend it to anybody- but now older and wiser- less my life savings and house! Good news- now back on track and hopefully pointing in new direction. Had some fun in between company and jobs- recently asked to do Sara Beeny's Channel 4 program- see Swinton and Lythme St Annes program's(Chanel 4- i player)- series 2- 'Help my House is falling down'- no comments please- 16 hours of filming and 10 seconds of BAFTA material! Recently moved back to Lutterworth- learning to relax. Keep fit walking and climbing- just! Son James at Brunel- Industrial Design-loving it and looks like a promising future- we will see. Any body passing I know- please drop me a line- you will always be welcome. Trust all going well and you are enjoying your retirement? visits to Gloucester- Head Office. providing geological support as and when needed. Royal Academy of Engineering, so not a bad start to his career. department. Look forward to seeing lots of changes! I was recently down to Portsmouth and the department giving a presentation to the MSc students- a great time and a flash back from a long time ago! I'm now working for the NHBC as Principal Geotechnical Engineer and enjoying the challenge! I have also recently been promoted to Lt Col within the Staff Corps, so lots keeping me busy there! Trust all well with yourself ? I was just surfing the Portsmouth Geology site for the first time and read the updates from my contemporaries from 1980,Mike Holman and Chris Eaton, so I thought I would send you a quick update. I have to say that my career doesn't seem as interesting as theirs though. Left Portsmouth 1980 and joined the RAF as a pilot. After training as a helicopter pilot I served in Northern Ireland, Hong Kong, Germany and the UK as well as detachments in Australia and the Falkland Islands. Eventually I decided it was time to meet my children so I left in 1996 and retrained as a Secondary Science teacher - thanks to the Geology degree! I taught at Woodbridge School in Suffolk for about 3 years before the RAF realised their mistake and asked me back. So since 1999 I have been flying again, mainly instructing both new pilots and training flying instructors in Shropshire but an 'interesting' 6-month detachment to Bosnia interupted the smooth flow of things for a while. With the current cutbacks and defence review I assume I will be out of work in about 3 years. My youngest son is studying Geology at Cardiff so maybe its in the genes? If it is I hope he is brighter than me. 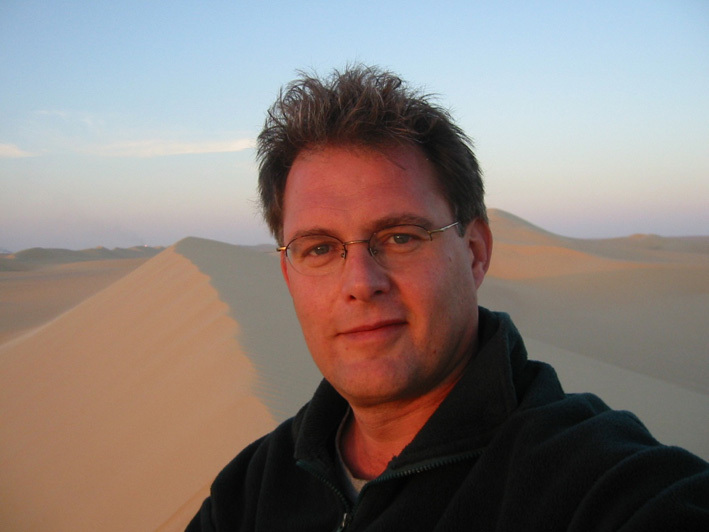 After graduating in 1980 and as a first job, assisted Dr Mike Ryan on a 6-week summer fieldwork contract of mapping and sampling in central Norway, I joined Rio Tinto as an exploration geologist, prospecting for sedimentary copper deposits in the Anti Atlas Mountains of Morocco. The project ended in late 1981, so I obtained an RTZ bursary for the MSc in Mining Geology at Camborne School of Mines that I completed in 1982. I was then recruited on the ‘University milk run’ (as it was in those days) and joined Gencor, posted to Beatrix gold mine, one of South Africa’s newest operations at that time. After two and a half years in the Free State and having seen the mine from shaft sinking through to full production, it was time to move on and I joined RTZ subsidiary, Rössing Uranium in Namibia where I was involved in multi-commodity exploration. In 1993 I left Rössing and the Rio fold to set up as a Minerals Industry Consultant in Namibia, offering a range of services to both local and international clients and was involved in a wide range of commodities and projects as while as providing environmental management services. At the end of 1996, new opportunities arose in South Africa and I joined the New Mining Business Division of Anglo American based in Johannesburg. I have been involved in numerous technical appraisals and feasibility studies and provided technical support to various Anglo Base Metal projects across Southern and Eastern Africa. Such projects included KCM and the Kabanga Ni project in NW Tanzania. I was recently appointed Exploration Manager Africa and am now responsible for Anglo Base Metals exploration activities in RSA, Namibia, Zambia and DRC and for advancing business opportunities in Africa through alliances and partnerships. I am now a senior lecturer at the University of Leicester and the Science Faculty Sub-Dean (Graduate Studies). On the research side still working on Precambrian rocks and also now involved with Ocean Drilling through the IODP programme ( head up the European Petrophysics Group and also head of Leicester consortium with Lamont-Doherty Earth Observatory US). Professor Tim Brewer collapsed and died on 14 July 2007, while attending a conference in Barcelona. At the University of Leicester his research interests included Precambrian crustal growth in the North Atlantic regions, the application of wireline logging to the understanding of ocean floor evolution, analytical geochemistry and the geochemistry of Earth materials. As such he took the lead in the European Petrophysical Consortium, part of the ECORD Science Operator for the Integrated Ocean Drilling Program. (Brian Walton). Thanks for the email. A snapshot of my career to date below. I have had several long spells in the Middle East in tandem with Pete Larkin, Steve Mumford and Andy Williams. Lost track of Steve now, though no doubt he will surface. Currently working in London, though traveling abroad a lot. place. Also I spend time at the company's base in Aberdeen. Class of '81 with Greg Power! + Assessment of capital fund projects. + Consultant to international stations. - business development including academic, "blue skies" , type R+D as well as commercially driven projects. + Sales effected by long term contracts and short term "quote contract" bases. + Distribution of product (tanker/tipper hauled). + Greenfield ,£12m cap new j.v. between A.R.C./R.T.Z. + Further products included insulation and premium "pre-cast"
+ Also worked as operations manager for 9 plants controlling fleet specialised mortar trucks. + Oil/coal exploration with both 2 and 3-D surveys. + Assist with wayleave negotiations. Amateur palaeontology and mineral collecting (still Fellow of Geological Society-Coal Geol Group). Previously committee member of regional Concrete Society (organiser of Regional Golf Day and team captain for national event ). Enjoy most sports presently golf, squash , soccer and running . 1988 - 1995 worked as production manager for Colourmap Scanning Ltd in Putney, London. 1995 - 2001 moved to Scotland and worked as the cartographic manager for HarperCollins Bartholomew in Edinburgh, then Glasgow. 2001 - to present joined Survey & Development Services LTD in Scotland as production manager and after a change of company ownership took over as director of DSM GeoData LTD in 2004. Our parent company is a large Indian production centre and we deliver photogrammetric and GIS services to companies and agencies throughout the UK and Europe. Just celebrated 20 years of marriage and living happily in Stirling, central Scotland for the last 10 years! I trust that will suffice for now. Glad to hear that you are well. I have not kept in touch much with my fellow graduates apart from Peter off and on over the years. It would be good to hear how they are all doing too. Every time I drive through Glencoe (which was just the other week as it happens) I remember scrambling up the sides on a field trip - even got a photo somewhere. based on a new site overlooking Langstone Harbour (can see QEQM). who merged with the Portman Building Society. Information & Marconi Underwater Systems. 1981-1984 Mud Logging with NL Bariod Petroluem Services - worldwide. Thanks for coming back to me. I'll try that. I worked with EXLOG for 4 years before leaving just before the Piper Alpha disaster (luckily, as I was on Claymore just before). Not sure what year that was, but possibly 1988? There are many hazy areas, but I drifted into the restaurant business, firstly in Notting Hill in 1990, where I lost a fortune, but learnt heaps, and then in Soho in 1993 where I have been running the Union Club (a media hangout) ever since. It's a tough business, but over the years I have managed to avoid alcoholism (or worse) and these days I am lucky enough to spend more time surfing or playing golf than I do working at the coal face. Technology helps. Like many these days I started a family quite late and now have two boys aged six and two who beat the hell out of me on a daily basis. It's great, but painful. That's about it. I'm afraid it's not much of a story, but I did climb Mont Blanc last year! Thanks for that. I've given it a try. I have 2 kids - boys, but didn't start till late so they are only 6 and 10, so still in the thick of it really. 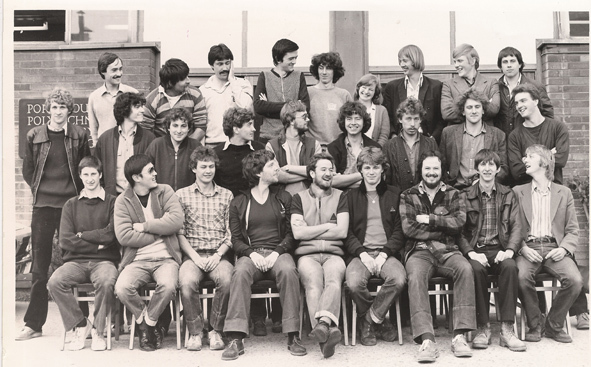 I still see several of the 79/80 in take; Nigel Austin, Pete Faro, Ron Collier, Pete Davies, Pete Larkin. In fact I was sailing with Nigel last Sunday - he's Commodore of a sailing club in Northamptonshire. I often think about you guys - you must all be in your 90's by now ! It would be great to see you sometime, so if you have business in London (at the Royal Geographic Society for example) give me a shout and i'll stand you lunch at the Union. Do pass on my best wishes to Mike Ryan - i spent a wonderful 6 weeks in Norway with him in the summer of 1980 (I think). Immediately after graduating, I worked on an unpaid/low-paid basis at the Booth Museum of Natural History. Then I had a couple of boring secretarial jobs, before being appointed Publications Secretary at the Geological Society in December 1985. The job evolved and became more editorial after the Publishing House was set up in 1988, and in 2000 I officially became the Society's Commissioning Editor (I'd been doing that job for a while). I also manage the day-to-day running of Journal of the Geological Society. This is an interesting and unique job and I enjoy it very much (most of the time!). 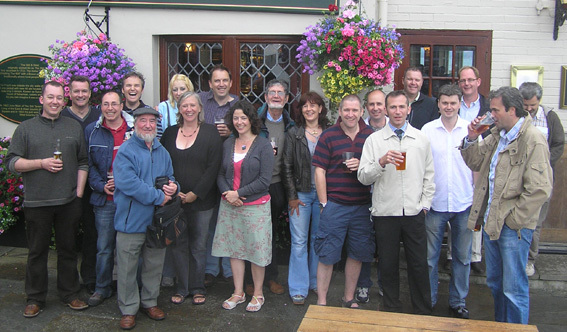 There's a recent pic of me on the Society's website: http://www.geolsoc.org.uk/template.cfm?name=staff22. To back track : 1983-1995, I spent a fair while out in the Middle East / Indian sub-Continent / East Africa / S.E Asia working as a 'jobbing' Engineering Geologist. A whole host of different companies / types of companies and even the odd NGO, fulfilling probably pretty much the full gamut of what an 'Engineering Geologist' does ... Site Investigations, EG & Geomorphological Mapping, shallow Geofizz, / slope stability / Ground Water / Foundation / Geotech Design etc etc. This takes me up to about 1995. From here I was based in Dubai working for a Marine Geotechnical Contractor and more latterly Fugro ... pretty much Project Managing a whole host of coastal engineering, inshore & offshore geotechnical projects (fortunately, I have not been involved in any of those hideous 'Palms' and other monstrosities one sees in Dubai / M.E. today!). Then in about 2000, I set up my own company and did my own thing, mainly connected with the burgeoning 'submarine fibre optic cable' industry. Governments &Tele Comms companies were installing vast global fibre optic cable systems around this time. Clearly, with significant seabed / shallow geology / geotechnical considerations / implications. I tended to Project Manage the geotechnical / geophysical aspects of many of these projects - working out of Korea & Japan for a good part of the time. In 2004, I decided it was time to return to these fair shores. So, I stopped contracting and took a staff position with a Company called Stolt Offshore Ltd. Stolt essentially being (or at least in my context) a sub sea engineering company, installing subsea architecture, pipelines etc for the oil & gas and renewables sector (Stolt incidentally, were instrumental in the attempted rescue and subsequent raising of the Kursk) . Based in Aberdeen, I help run the 'Geotechnical Dept'. which performs all manner of support activities for multifarious Stolt projects, in addition, to offering external geotechnical, geophysical / hyrographic survey consultancy services. This year has been the big GIS push - so, I've been quite involved with implementing GIS into the Company's systems etc . We also do some collaborative R&D with Dundee Univ. I'm currently enjoying this management position immensely - in some ways very much connected to 'geology' geology, in other ways not quite so ........... Though, I must say, I did visit my old mapping project area the other weekend (The Arnaboll Thrust up at Loch Eriboll - Peach & Horne Country) .... I'm sure that would cause a few extra strokes of John Whalley's beard!!. Good to hear from you - yes, indeed, I've almost turned full circle. I'm now living in bucolic splendour on the west Sussex / Hants border. As you'll probably recall, I was living and working up in Aberdeen for the last 5 years or so (running the Geotechnical department for a subsea installation contractor). I've now moved to a company called Metoc (www.metoc.co.uk) ........ strapline where the environment meets engineering. My remit is to establish a 'Geoscience & Characterisation' capability. This will embrace employing engineering geologists / geophysicts / oceanographers / meteorologists / environmental scienticst and the like - quite a challenge! I'm in touch with Nick Koor but perhaps one fine summers day could bimble down to Chidham for a social pint and a chat (my contact details are below). We never did make it for that pint in Chidham / Bosham. Oh well, there's always Bath! to Senergy (a company I have had many dealings with in the past). My role at Senergy is a combination of things but generally to assist build the company's capabilities with particular reference to Oil & Gas and Offshore Renewables and Carbon Capture & Storage (CCS) markets etc. All very challenging and all good stuff! No problem with putting my e-mail & mobile number on your contact listings, by the way. Congratulations to Mike and Greg next time you see them. I'm now living in Fulham, trying to wean myself off the oil business. Have reached a stage now where I am investing my ill-gotten gains, unimaginatively, in property - mostly in Eastern Europe, which hopefully will mean I can concentrate on my vineyard in Spain, and the whole winemaking process. The last couple of vintages have come out well - I'll have to bring a bottle down to Pompey next time I visit. I bumped into Dave Gittings a month ago at a course in Aberdeen, and managed to reunite him with Pete Larkin, who was also in town. I sent your message on to him, so hopefully you'll hear from him soon. I'm just back from Calgary, where I was running a prototype tool in Saskatchewan, which worked! It was measuring the downhole pressure while drilling - both drill pipe pressure and annular pressure, at the drill bit. Useful information for the geologist when drilling through the reservoir. I've attached a photo from the desert in Libya, in the Sarir field. I had just found a pile of machine gun bullets, left over from the skirmishes between Rommel and Monty. One guy found an original Jerry can, complete with Wermacht insignia. The only souvenirs I could take home were some petrified wood, and a set of camel kneecaps, surprisingly dense, no doubt ideal paperweights. OK Brian, look forward to hearing from Mike when he has hooked up his laptop - cc my message to him. I've retired from the oilfield now, nursing my property portfolio currently, which is ticking over nicely. My wife has been promoted to CMO of Google, so has the option of doing the job from here in London and travelling a lot, or going over to Silicon Valley for 18 months, and not travelling. So we've decided on the latter option. My son is 2 now, so if we're going to go, now is the time, before he is of schooling age. Find attached shot of said monkey. He's adorable. So I will be a man of leisure out there, golfing, fishing, and looking after my boy in the afternoons. Could be a lot worse! Hope all goes well for you, I mentioned you to various people who turned up, so you should be getting a couple of emails. Nice to know someone's keeping tabs on us. Andy Williams forwarded your e-mail to me. In case you can't remember, I graduated in '83, seems like a lifetime ago. A brief update on what I've been up to. Started work offshore on oil rigs in '84, lived in Hong Kong, Thailand, Australia but mostly Singapore. Worked all over Asia, Middle East and Caspian. Have been living in Dubai last 3 years. Am Operations Manager for PathFinder Energy Services. We supply Directional Drilling and Logging Whilst Drilling services. Brian, I lost contact with Sean Caldwell, Alan Clarke and Paul O'Driscoll, if by any chance you come across their e-mail addresses, I would be really grateful if you could forward them to me. Here's my update, as promised.........at last! Since graduating, I have pursued a career in local government specialising in leisure facility management. This was an area I had an interest in whilst studying given that I was (not so much now!) a keen and active sports enthusiast. I am currently employed by Chichester District Council where I manage Westgate Leisure, which comprises the Westgate Leisure Centre in Chichester and the Bourne Community Leisure Centre in Southbourne. As well as providing traditional indoor and outdoor leisure activities one of my major responsibilities is to contribute towards Local Strategic Partnership objectives that centre upon health, well-being and inclusivity agendas. As a senior council employee I am responsible for multi-million pound expenditure and income budgets, over 200 employees and over 900,000 customer visits annually. Whilst I always intended to secure employment within the geological world, I have not been at all disappointed with the way fate has turned out for me. I find my role thoroughly rewarding and there is no doubt that many of the skills I acquired whilst at Portsmouth assisted me on my way. Geology remains a keen interest for me, although I'm probably 'very rusty'. On the down side (based on feedback from colleagues) I remain an obsessed and active Fulham FC fan and have developed into, if I may say, a competent birder (NOT 'twitcher') which has led to me becoming treasurer to the Portsmouth RSPB group. Damn good idea to get everyone to extol the virtues of a geology degree from pompey particularly, if like me, graduating at a time (1983) when anyone seemingly was more employable than a geologist; and getting a geo job was somewhat marginal at best. I therefore did the decent thing and got on to an IT postgraduate course at pompey. This allowed me to continue my life’s work of sampling the beer houses of Hampshire and surrounds whilst making myself employable. All of a sudden it was 1984 and I was a systems analyst for some London council and hated it. 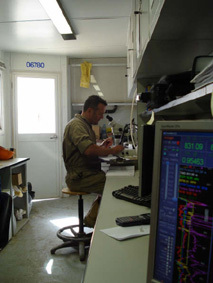 I then got a phone call saying that there was a job for a geologist in Saudi as long as I didn’t mind camping a bit and living outside and there I was working for Al Hoty- Stanger as an engineering geologist. The irony of having done a geology course and becoming an engineering geologist was not lost on me. I followed closely in the footprints of Steve Mumford and Peter Larkin .Within 5 years I was geotech manager and then regional manager. I worked all over Saudi and did jobs in Bahrain, Sudan, Egypt and Oman. I enjoyed the work, the place and the life. Rugby remained a large part of my life, keeping me sane but also from being too sober. I married Sarah, an aussie nurse in 1988, who travelled with me throughout my career. Hi Brian, good to hear from you. I am still in Blackpool and still working at the Sandcastle Waterpark - 25yrs in June.... unbelievable!!! After graduating in 1984 I joined a September training programme with Exploration Logging Overseas, along with Paul Reid and Nigel Bramwell. Actually we shared a hotel room in Windsor for the two weeks of training. As soon as training was complete I was assigned my first mud logging job, in Tunisia. There followed a few years of mudlogging and occasional wellsite geologist duties in Italy, Sierra Leone, Liberia, Morocco, Libya and Denmark, before going into the Windsor office for another couple of years where I was writing well reports and drawing up post-well logs. It was here that Nigel and my paths crossed again - he had left Exlog and joined Phillips Petroleum, where he was an Operations Geologist. One of our contracts was to draft logs for Phillips. In 1990, I replied to an ad for a "Computer Applications Geologist" at Phillips in Woking, and was offered the job. I found myself following the geologist career path in Phillips - from computer mapping of fields and exploration prospects (that's what a Computer Applications Geologist does), through the Operations Geology group, and on to project geology. Whilst in the Ops Geology group, I met fellow 1984 graduate Clive Williams who was embarking on his wellsite geologist career on on of our wells in the North Sea. I worked a number of projects for Phillips in the UK, from field development on the so-called J-Block fields in the Central Graben of the North Sea (Phillips had a tradition of naming fields with female names, so the J-Block comprised the Joanne and Judy fields, along with discoveries like Julia, Jacqui and Jill), to infill drilling on mature fields Maureen and Anne (more ladies' names!) and new ventrures exploration west of Britain. My new ventures exploration experience was handy when Phillips established a small Middle East Exploration department in Woking. Myself and three colleagues spent two years producing a regional play fairway study of the Arabian Plate and Zagros area. Then in early 2000 I took the results of the study, myself and my family (wife and two girls, born 1996 and 1999) to the Global New Ventures group at the corporate HQ in Bartlesville, Oklahoma, from where I continued mostly on Middle East business development opportunities. Bartlesville was a real culture shock small town America, the buckle of the bible belt, and dominated by Phillips - a town of population 30,000 with some 3000 Phillips employees (and that was down on what it had once been). Not quite like living in the home counties - had to drive 50 miles (to Tulsa) to get decent cheese! While we were living in Bartlesville Phillips took over Conoco in "a merger of equals" changed its name to ConocoPhillips and moved HQ to Conoco's place in Houston. So we moved with it, still working new ventures - focussing on Atlantic Margins now - and spent a year in the heat and humidity before being shipped back to the UK in late 2003. As part of the merger, Phillips' Woking office was closed and people quit or were moved to Aberdeen, so we moved from the US there. I spent 18 months working on a new field development West of Shetlands called Clair - operated by BP, this giant field contains moderately heavy oil in a fractured Devonian fluvial reservoir, and had taken nearly 30 years from discovery to development, primarily due to complexity of the geology and the hostile environment. Then in early 2005 I was asked if I would relocate myself and family to Stavanger, Norway. Here I worked on another giant, Heidrun Field, which contains oil and gas in Triassic-Jurassic fluvial to tidal estuarine to marine reservoirs. We had three very happy years in Norway, enjoying as much of that wonderful country as we could, before moving back to Aberdeen, now in a subsurface team leader role, back on the J-Block where I started with Phillips some 18 years before. This field area has matured into a core area for what is now ConocoPhillips, and produces predominantly from the Triassic Skagerrak Formation braided fluvial sandstones, with contributions from the Chalk and from Paleocene fan sands. We have exciting times - drilling wells and developing new fields to use the existing infrastructure, and working with very talented geoscientists and engineers. We live in outside the city with wonderful views across the Aberdeenshire countryside and try and enjoy what Scotland has to offer - from mountain biking to skiing as well as the city life. Expect we'll be here for the forseeable future - at least while the children finish school. Hope this is not to long winded, feel free to edit as you see fit for the Portsmouth pages. I graduated from Portsmouth in 1984 with a plan to travel to Africa (too many Stewart Granger movies as a child I guess). I accepted a job with Anglo American on the Vaal Reefs gold mine, which paid a lot less than the civil engineering and oil platform jobs in the gulf and North Sea which were popular at that time. But it was Africa and that was all I wanted. On arrival in Johannesburg, the first thing I was asked was whether I would prefer to go and live in a caravan and do diamond exploration. This was a no brainer. Work a mile underground or under the African sun? Hmmm...... So off I went to Kimberley to join De Beers South African exploration team. In those days, South Africa produced relatively few geology graduates, and so I was part of a large contingent of pommes recruited to work for the Anglo/De Beers group in various operations in southern Africa. Many, like me, stayed, got married, and became perpetual exiles from crowded and gloomy England. (But to a man we all still cheer the English cricket, rugby and football teams.) Others whose names I knew from Portsmouth came, such as Ralph (Rushton?) and Dave Catterill, but I never met up with any of them, being stuck out in remote parts of the Karroo or Kalahari, with my Hi-Lux 4x4 and caravan in tow. Regular visits to Kimberley quickly became the highlight of a job that involved long periods in places with names like Zoet en Zuur, Wag 'n Bietjie, and Prieska. Afrikaans is the lingua franca in these places, and occasionally you find farmers still fighting the Anglo-Boer war if only in spirit. But generally the farmers of the Northern Cape are a friendly bunch, with astonishing hospitality, and an equally astonishing capacity to eat meat. This is the home of the braai (barbecue) and Castle lager. After spending 5 years running around the Northern Cape finding lots of kimberlites (but no significant mines.....one small mine opened on one of our discoveries, but not by De Beers), I was packed off to Rhodes University to do my MSc in Exploration geology. Having worked for some time, I was able to approach these quite intensive studies in a far more organised and disciplined manner than I had managed at Portsmouth, and came out with a distinction. After this I was given a number of office based jobs. I was appointed Deputy Exploration manager for De Beers exploration activities in the then Transvaal, and appointed to the diamond sample laboratory in Johannesburg where I was required to test and commission new diamond recovery technologies (chiefly X-ray machines) to accelerate the processing of diamond evaluation samples from new discoveries and mine expansion projects. In 1996 I was sent to Guinea in West Africa to set up an exploration operation on the Man Shield, and then to Tanzania to manage the exploration activities on the Tanzanian craton. These were great jobs, and I can recommend a stint in developing Africa to anybody. I would gladly have stayed in Tanzania, but the kimberlites we found (over 100 new pipes) were just not diamondiferous enough, and in 1999 I was sent back to Johannesburg as Technical Assistant to the Director of Exploration. This is a much sought after and prestigious position, but I soon discovered that the reality did not match up to myth. True, De Beers was undergoing a quite fundamental change in both culture and business model, and to be at the centre at such an important time was very interesting. But I also spent much of my time deflecting flak from the metallurgical and mining engineering disciplines, which didn't strike me as a particularly constructive use of my time. The working relationships within the organisation are much improved today, and I think the TA job is consequently more fulfilling. But at the turn of the millennium, there was a lot of change starting, and the mining disciplines were particularly spiteful toward each other, trying to protect their turf. So the first opportunity to get back to exploration that came along was grabbed with enthusiasm, and that opportunity happened to be India. India had been gradually liberalising foreign investment rules through the late 90's and in late 2000, a decision was taken by De Beers to start exploration there. I was in Bangalore recruiting my first staff a month later and have been here since. The Indian operation now employs nearly 100 people and we are finding kimberlites. Hopefully it is only a matter of time before we make a significant discovery. it is great to hear from you. I am well and still living in South Africa. I left De Beers in 2008 after 23 years and joined a consulting firm in Johannesburg. I am working as Principal Diamond Consultant as well as doing some project management and general consulting on other commodities. Please pass on my regards to anybody you speak to from the class of '84, as well as the department when you see anybody there. And let me know if you are coming to SA again anytime soon. Nice to see you here on Facebook. When I was at Portsmouth I was Cane not Stevens - but did marry a mining geologist from Imperial! There are a few pictures from the field trip to Norway in 1983 on my area if you wish to re-live some memories! Since leaving I worked for the MOD - writing and designing 3-D terrain mapping programs before moving onto Hart and Slough councils to implement and run the Community Charge/ Council Tax/ Business Rates and planning systems. Then took a career break to raise 3 children before returning to work in the library at UCA and currently at my old sixth form college. In January I am moving to the University of Surrey to work in data analysis for the HESA returns. Obviously didn't use my geology knowledge but the skills learnt have stood me in good stead in all my jobs and gave me many happy memories. Hope you are well and a very Happy New Year to you and your family. Andy has sent an interesting, and rather harrowing, account of his career. It's quite long so I have included it as a PDF file link. Hi Brian, Good to hear from you. Yes sure - here's a biog. It was never the most obvious career path but I traded Geology for journalism after completing my degree at Portsmouth in 1984 and a MSc in Hydrogeology at UCL the following year. I remember the day the rot set in, on my way to a lecture on fluid flow through fractured rocks at UCL. As I climbed the escalator at Warren Street tube I noticed a sign for 'Operation Raleigh: Venturers wanted'. The photographic backdrops looked glamourous enough - jungles, the high seas - and there was the added advantage of postponing a proper job. So I applied and was accepted for an expedition to the Solomon Islands. Returning to the UK in 1987, I worked in engineering geology for a while but soon my eye was caught by the post of 'reporter' Ground Engineering magazine. Well it was hardly Rolling Stone, but it was a start. And from there I worked on a series of construction magazines with exotic names such as 'Underground' (which sounded cool) and New Civil Engineer (which didn't but was a good place to learn). I realise now I was fortunate to be working with a couple of editors who had an appetite for mischief and a disdain for authority. Improbably, they sent me to cover the first Gulf War in 1991 and I used this experience to persuade the BBC to take me on, first as a regional correspondent for radio and tv in Bristol, then the Money Programme, Radio 4's documentary strand 'File on 4', then Panorama and Newsnight. In a media world dominated by the arts (the Tarquins and Sebastians - PPE, St John's) Geology, or any science for that matter, is not such a bad place to start and there is a certain fellowhip amongst the science grads gone astray. Lovely to hear from you. Hope you're keeping well also, looking at the photo you don't seem to have changed much at all in the last 20 years, unless of course its an old picture. Its been a real trip down memory lane looking at the photos from Alison. I started working as a geologist in the oil industry soon after leaving Portsmouth with the intention of doing it for a few years before settling down a bit. 24 years later and I'm still working as a consultant geologist, mainly for BP down at Wytch Farm in Dorset, though last year I did a few wells in Tunisia. I used to work in the Far East and all over Africa but I'm getting to old to be bothered with all the travelling now! I'm living in Swansea with 2 little ones, Matt 5 and Joe 3, so they tend to take up much of my freetime, not that I'm complaining about that mind. I've lost touch with all the old friends from Portsmouth though maybe Facebook will allow me to get in touch with a few more. 1996: Promoted to Editor of QM, which is where I am today. I am also editor of the 'Directory of Quarries and Quarry Equipment', and Press Officer for a very large 'live-action' trade fair for the quarrying, construction and recycling industries, held every two years at Hillhead Quarry near Buxton. While publishing might not seem like an obvious career choice for a geology graduate (I fell into it by accident), I would certainly recommend it to others. It can be quite challenging and stressful at times, but the rewards are pretty good -- job security, reasonably well paid, plenty of 'perks', and can involve a considerable amount of travel (in my case, as well as visiting countless quarries and manufacturing plants across the UK, it has also involved jaunts throughout most of Western Europe as well as parts of the US and Asia). As it is 30 years since I graduated, I thought I would send an update. I did the Masters in Palynology at Sheffield and came to Cork in 1986 to undertake my Ph.D. I am still here and a Lecturer in Geology. Hope you are well. Happy New Year. I left Portsmouth in 1985, the era of Gordon Coumbs, Kieron O'dowd, Bob Phillips John Wells etc, and wandered if there was going to be any reunions coming up. The last one I came to was about 4 years ago, just after Paul Dicker had died. I notice that Brian Walton is not on the staff list any more, has he retired? I spoke to Gordon recently, who is also keen to meet up. I am now a Deputy Head Teacher in Sandwell, teaching mainly chemistry, which now has the earth science parts, but not enough. Remember the bottle of wine you downed in one, on the Forest of Dean trip - fond memories. I have just stumbled across this website and of great interest to read of fellow students whose names I had almost forgotten. I was a member of the class of ’85 and on graduating joined Core Laboratories as a Mud Logger working in Syria for Pecten (Shell) and offshore County Cork on a Chevron semi-sub rig. After that short spell, I’m afraid I deserted the cause and moved into the world of finance, joining a high street bank and rising to the lofty heights of Assistant Branch Manager before realising retail banking was not for me. During that time, Andrew Warr, also class of ’85 joined the same bank and he and I have been close friends – he is godfather to my daughter - since we met during the first week at Portsmouth in 1982. And one other name from the class – I came across Daren Glenister, who is now in Houston, Texas via linked in. My career subsequently has been in various asset management firms in the City and I’m still there – working for a US-based Asset Manager near Liverpool Street. I’m on Linked In for any readers who want to get in touch. I married Jane Berry (Biology, Portsmouth, ’85) and we have two children. My son is now at University and we returned to Portsmouth a couple of years ago on an open day. He’s studying civil engineering and it was a great pleasure to see that the Civils lab is in the bottom of our old building – Burnaby. I confess, I hardly recognised the place although I see the ‘huts’ – all be it more modern versions – are still there. 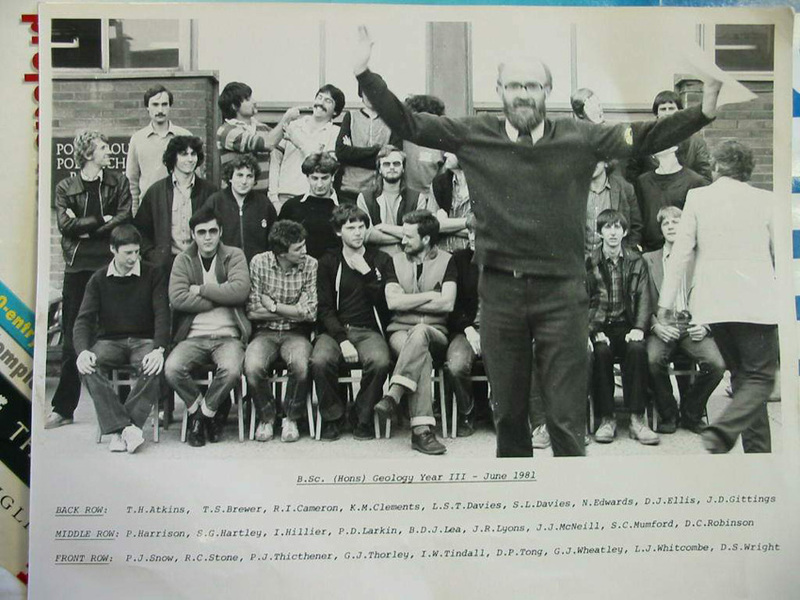 God – crystallography in those sheds – I had no clue about it then, let alone 30+ years on! I’m a hobbyist geologist and, as my children were growing up, it became a family joke that if we went to beach, my wife and children headed for the sea, I headed for the cliff! Pride of place in my home office (sounds very grand – the spare room) goes to various illicitly obtained samples from various field trips. My best wishes to all Brian’s and Mike’s (I don’t think there were any other names permitted on the staff); have a beer for me in the Eldon. After a brief spell mudlogging in West Africa with Exlog, I joined (1988) one of the biggest construction projects in the world, the Channel Tunnel, as an engineering geologist/geotechnical engineer. 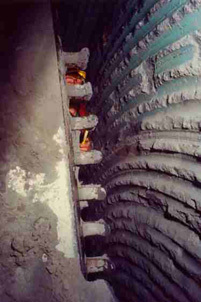 Based on site and with my colleagues (which included Miles Friedman, Brian Shepstone, Michael Black & Andy Withers, also 1987), we were responsible for investigating the ground conditions ahead of the tunnel boring machines and monitoring the ground conditions actually encountered. We also monitored the performance of the rock and tunnel lining using a wide variety of instrumentation. I stayed with project long enough to see the construction of the large undersea crossover cavern before I joined London Underground to plan, design and construct the 15.7km long extension to the Jubilee Line through central London (1990, I was later joined by MF, MB and AW, BS preferring Hong Kong). During this time I also completed a part-time MSc in Geotechnical Engineering at the University of Surrey (1993) and then spent two years undertaking research on ground movements and building settlement at Imperial College. Sensing the approach of my 30th birthday, I upped-sticks and spent a year driving around Australia in a mustard coloured VW Combi where I caught up with old friends, visited the stromatolites at Hamelin Pool and worked for Coffey in Perth and Newcastle. Returning to the UK (1996), I worked with a number of different engineering consultants mainly on tunnelling projects in the UK and in Hong Kong. In 1999, I joined High-Point Rendel in London and in 2000 moved to Singapore to work on the 48km long deep tunnelled sewerage system. Research, on the engineering geology of the Lambeth Group (Woolwich & Reading Beds), which originally formed the basis of my MSc, was eventually published in 2003 by CIRIA. I became a Committee Member of the Engineering Group of the Geological Society in 2003 where I am responsible for International Relations and am the Newsletter editor (www.geolsoc.org.uk/engineering). In 2004, I formed Engineering Geoscience Ltd and have since been helping clients in the UK, Greece and Italy, mainly on tunnelling projects, but also provide other services in business improvement, business development, project and contract management and communication. Somewhere under the English Channel between Dover and Calais! Inspecting the face ahead of the TBM boring the Service Tunnel from the UK (1989). The green material in the top of the picture is the Glauconitic Marl and the grey material below, the enigmatic '6A' (either uppermost Gault Clay or lowermost Chalk). some dosh in my pension fund ! laterals to do, so I think that will keep me busy for the rest of my hitch. I am still working for Favel C.A. as a contract Well site Geologist. here in Venezuela. Hard to believe that I've been working out here for 11 years !! I worked with Geoservices from graduation to Feb. 1999, but I'm glad I made the move to Contract Geologist. Favel may not be the best day rates in the world, but I do get flexibility in my time off, which I've made great use of for holidays, and spending time at home. The work here in Venezuela is relatively simple, though we are at the leading edge of horizontal drilling technology. when they get their Christmas cards !! Group. Far far far better wages than Venezuela ...exceeding £500 a day ! very busy - and they are getting extra rigs built to accomodate the work. With luck I'll get a further contract out here ....we will see ! 40 in August too .....can you believe that ! I hope that you are both well, and that you enjoyed the heat of the Summer ! I sent the following out yesterday ...but forgot to put you on the list ! >age a year during that time ...though that happens every August I guess !! >has been up to 48 degrees last week. >21day rotation - no matter what is happening on the rig. >Hope that all is well with you all !! interesting to see the changes from when I left 7 years ago ! I hope that you are both well, and that the family are all doing great. I am in the delightful Algerian desert at the moment, way to the south of the country. It is betweem 45 and 50 degrees at the moment, so I try to run from air con to air con ! 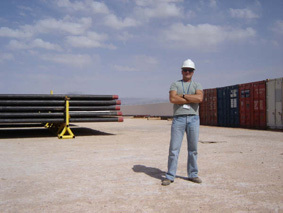 I am contracted to BP at the moment, locally they are BPXA ( for Exploration Algeria ). Regular 3 week / 3 week rotation, and typically things are not running to plan. Initially my contract was just for 6 months - and for 2 weeks that seemed ample. BUT the first well took double the time, so the WellSite Geologist contracts have been extended to the end of September. I wanted to get BP on my CV - so I have ! They have offered a 21 day full pay bonus if we remain to the end of the drilling ..so 'yes please' ...and it looks like they want us to be available for the future phases of drilling in this area. So, all in all, I think it was a good move. Well, it beats sitting at home ! " see below, lifted from our company detail. Mike graduated in 1988 with a BEng in Engineering Geology and Geotechnics from Portsmouth Polytechnic, thereafter joining Geotechnics Ltd as a Graduate Geotechnical Engineer. In 1992, he became the first employee of IGES, and assisted Willie Whitesmith in growing the company. In 2002, he took over the role of Marketing Director, in addition to his responsibilities as a Principal Engineer. In 2004 he attained the SiLC (Specialist in Land Condition) qualification. In October 2005 IGES was taken over by Applied Geology, a trading division of Xplor Ltd, where Mike is currently an Associate. Hi Brian, I saw that you’ve put together a website for Portsmouth graduates – it makes an interesting read, thanks for doing that! Graduated from Portsmouth in 1988 with a BSc in Geology, went on to do an MSc in Mining Geology and Mineral Exploration at Leicester University, then started working for Esso in London. Moved to New Orleans in 1993, and then quit working for 8 years to start a family (3 kids). Started back at work for ExxonMobil in Houston, Texas on the IT side of the business some 5 years ago. Graduated from the Engineering Geology and Geotechnics Course in 1988.
a career highlight, with other shorter term assignments in the Far East. Joined AngloAmerican Gold & Uranium in early 1989 as a Mine Geologist in Welkom, South Africa. Worked there until mid-1992, then off to Queen's University, Kingston, Ontario, to do a Master's in Mineral Exploration. Joined Canarc Resource Corp in 1994 as exploration geologist in Suriname, South America - stayed there until early '98, then moved to Vancouver as Canarc's Acquisition Manager, where I worked until the company, like many other junior companies, ran out of money. Then made the easy transition to Consultant Geologist, which sounds better than unemployed geologist! 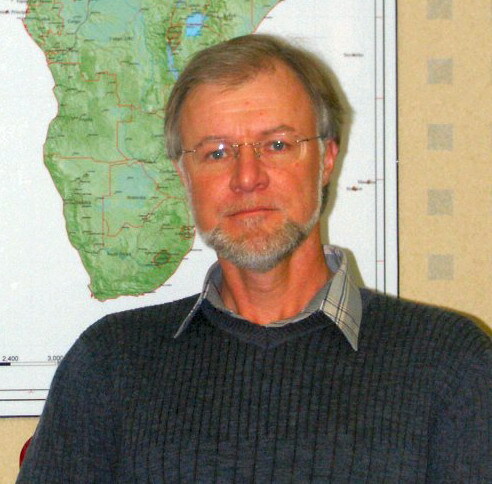 In 2001, with Chris MacKenzie (also a 1988 Pompey grad), formed BAFEX Exploration Ltd in Namibia. We took the company public in 2004, listed on the Toronto Venture Exchange as Helio Resource Corp. Raised CDN$2,500,000 in November / December 2004, and are now trying to spend it as quickly as possible, and hope to find something along the way! Currently, we have nine projects, eight in Namibia and one in Botswana. Principle targets are copper and / or gold, but the Botswana project is for diamonds. Hope all is well and the Geology Dept. is still going strong. I enjoyed my time and it has set me up well with Geoservices all over the world (Asia-Pacific, South America and now Middle East & Caspian). I now work for Yeandle Geotechnical Ltd (YGL) in Exeter and am a senior Engineering Geologist and a director. Worked for Geotechnics Ltd between 1989 and 1999 after a very brief spell on the rigs which was not my cup of tea! Been with YGL for 6 years now, undertaking geotechnical and environmental site investigations mainly in the SW of England. Family are well - I am married to Nikie and have two kids Ben 7 years and Emma 5 years old now and live in Exmouth. Following my departure from Portsmouth, I embarked on a M.Sc in Petroleum Geology at Aberdeen University followed by a PhD in sedimentary basin evolution (Jurassic sequence stratigraphy) at Edinburgh University. I soon realised that a career in the oil industry was not for me, and hence I undertook a PGCE in Science Education at Bath University followed by a teaching post at Altrincham Grammar School for Boys (AGSB) as Head of Geology, where I remain today. My main role at AGSB is to teach advanced level geology to sixth form students as well as advanced level and GCSE physics, although I hope to start a geology GCSE course in September 2007. Student numbers are good, with four or more entering university Earth Science courses each year. I guess I am doing a good job in that the subject attracts healthy numbers, and because on three occasions my students have obtained the best advanced level results in the country. Although I am partially removed from the cut and thrust of the academic/industrial geological world, I keep abreast of developments by involvement in the Geological Society, other learned bodies and by fostering links with local geological companies. As a member of the Earth Science Teachers Association, I represent the interests of the Earth Science educational community on several key committees such as the Qualifications and Curriculum Authority (QCA) Key Stage 3 Review Group and the Assessment and Qualifications Authority (AQA) Physical Sciences Advisory Panel. I am an examiner for the Welsh Joint Examining Board (WJEC) and I hold the professional status of FGS, FRAS, C.Geol and C.Sci. I have also run an undergraduate field mapping and sedimentology course for extra-mural students at Manchester University for the past six years. Far more importantly than this diatribe is the fact that I’m having a great time with two recent additions to the family, Joanna (4) and Alison (3). Through the job I still manage to travel widely- I’m off to Peru in July for four weeks on a world challenge expedition, I venture each year to Cyprus on the A level geology fieldtrip, and as a stalwart of the school ski trip I’ve managed to ski at various delightful locations in north America and Europe- albeit with sixty spotty adolescent teenagers in tow! I can be contacted by e-mail on kevstephen@yahoo.com and details about the geology department at the school where I teach can be found by following the links on the website www.agsb.co.uk. Left Portsmouth in 1989 and joined Fugro in the onshore and offshore geology fields, which took me to such places as Hong Kong, Lisbon, North Sea and very wet Scotland, Wales and Ireland on too many occasions to mention. Did an MSc in Environmental Geophysics (Birmingham) in 1993 and then rejoined Fugro in their new Environmental Department. Spent the next 6 years doing Environmental Site Assessments (had to brush up on chemistry, hydrogeology etc). Inbetwen this Fugro sold their environmental department to ENSR and managed to blag a trip to the US with a colleague Chris Dainton to see how ENSR were doing Quantitative Risk Assessments. In 1999 resigned and went self employed at the same time as we were expecting our first child (which focussed the brain somewhat). Pursuaded Chris Dainton to join up and to form company called WD Environmental Ltd in 2001 (see www.wdenvironmental.com). We now employ 10 people and hope to continue growing, even in this somewhat challenging climate. Spend most of my time trying to win new work and chase the money. Maried with 2 girls (9 and 6) plus a very active west highland terrier called Tink (yet another girl). This environment provides me with the perfect climate to continue justifying having Sky Sports. Still keep in contact with people from Portsmouth days, in particular Simon Hassall and Tim Wynn. Enjoyed looking at the photos on the website...I have a few in my collection and was wondering if you were considering having a web page for photos of field trips past. Scroll down the page a bit to find the picture and if you click on my name you'll get a fairly detailed CV as well.